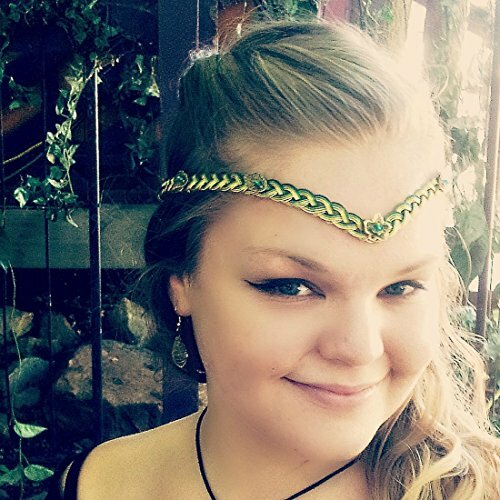 An ivy leaf focal piece is mounted on a Celtic weave circlet in gold and your choice of accent color shades. Leaves and matching crystals adorn the sides. Available in these shapes: V-Front is with a dip in the front of the Celtic weave band, as shown in the picture Straight is with no dip, straight like a headband or traditional circlet The back of this piece is open, designed to be tied together with long flowing ribbons, or just simply pinned here and there. This allows it to work well with many different hairstyles and updos. Our wire is nickel free and has a non-tarnish coat that keeps it shiny and makes it easy to wear even for allergy sufferers. PLEASE NOTE: "Shape Options" photo is included to illustrate the straight and v-front shape choices, but your circlet WILL include the leaves and crystals in the colors you choose like the design in the first photo:-) Yes-we do custom colors/shapes/sets- click "ask about a custom order" in the right hand column to inquire if you need something different than is listed here.